The Gloucester Community Concert Band's Spring Concert 2014 will be a Mother's Day jubilee, celebrating the ours and all the other mothers out there! 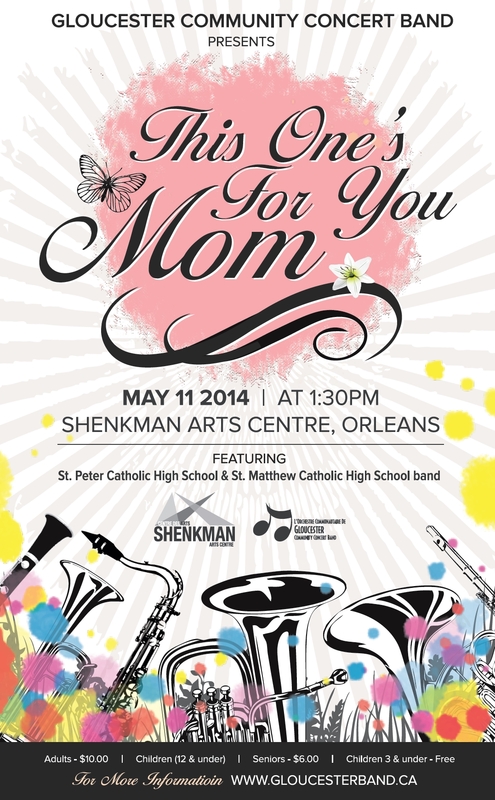 Come join us on Mother's Day, Sunday, May 11th at the Shenkman Arts Centre, and bring your mom along, too! $10.00 for adults at the door. The concert is also going to feature the St. Peter Catholic High School band and the St. Matthew Catholic School band, as well as a massed band of all three ensembles at the end. The GCCB will be playing for approximately 45 minutes and the high school bands playing for approximately 15 minutes each. We are currently on our Winter Roadshow – a series of private concerts at the various retirement homes around Ottawa. All concerts start at 7 or 7:15, so you should be there at 6:30-45. Don't forget to bring your own stand! ***Note that both the roads east and west of Wincanton Dr are Rossignol Cr/Dr. The Promenade is on the western one – at the corner of Tenth Line and North Service Rd/Jeanne D'Arc. Following our big Sprint Concert, GCCB is now in Spring Roadshow mode – a series of private concerts at the various retirement homes around Ottawa. ***Note for the public: we typically play in front on the street at this location, so feel free to come by and listen! 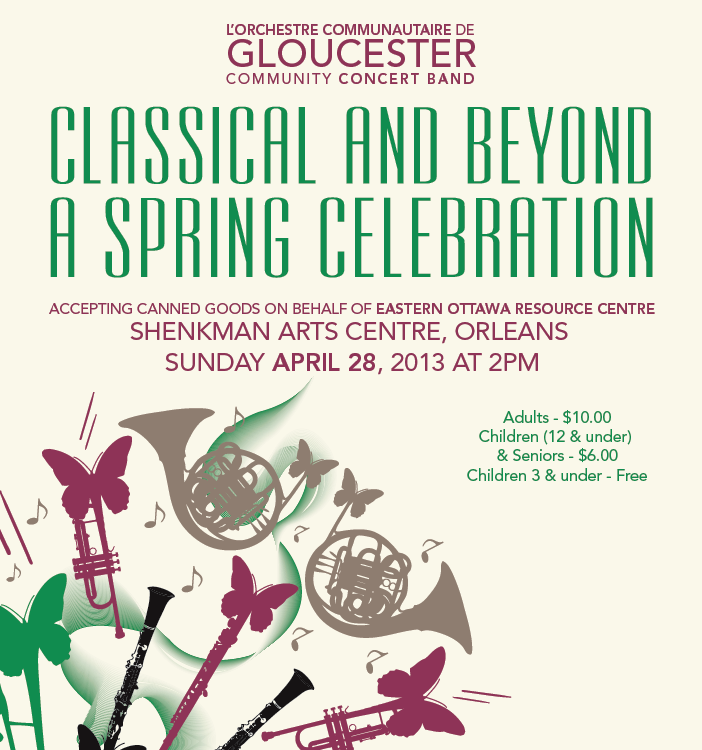 The GCCB 2013 Spring Concert will be happening on Sunday, April 28th. This is our biggest concert of the year, featuring over a dozen songs under both our conductors. Once again, we will be performing in Harold Shenkman Hall of the fabulous Shenkman Arts Centre in Orleans. This is a public concert, open to any and all fans!